A week and a day ago, Kristiana and I joined Cathy, Clare, Darryl, Noemi, Otis, Joy, and about 200 other people at Matthew and Monisha's wedding held at Bridgewaters, atop the Fulton Market in New York City. To say that our family loves Matthew is to put it mildly. That generous, kind-hearted, loving young man flew to Charlotte within 48 hours of hearing that Kristiana was in the hospital back in 2008. Both times she went into the hospital, he flew down here from New York to stand with us, to pray with us, to cry with us during the darkest hours of our entire lives. His heart is as big as the city in which he lives and was married. They knelt. They stood. They laughed. They cried. They exchanged vows. They took communion. They entered a new life together. They were both aglow from the inside. 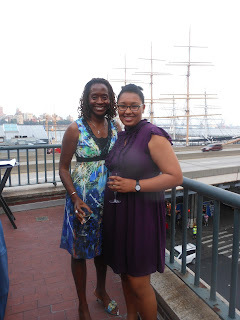 with sailboats behind us and the Brooklyn Bridge beside us. The sun set. The good times moved inside. have been in the same place since 2005.
Who doesn't love a tiny little linzer torte cookie as the party ends? How happy do they look??? We got a ride from the reception back to Brooklyn in the limo!!! How happy do we look??? Launa, Bill, Grace, Abigail, and Samson. On the way to the airport the following morning, we were reminded of the priceless gift of safety that we were granted over the nine days that we had spent in Connecticut and New York. I prayed for the safety of those involved in the accident and gave thanks for how well our journey had gone. Four hours later, touchdown in Charlotte. I love sitting above the wing and seeing those flaps come up when we land. then we celebrated life, love, hope and a future. Fun was most certainly had by all. come see us in Charlotte.